Are you interested in a high-tech, well-paying career? Are you ready to put your digital, programming, robotics and technology skills to use – today? And to build your career – working on state of the art, precision equipment? Are you looking to enter a career path with the potential to earn higher than average wages for the lifetime of your career? Do you want to continue your formal education towards an associate or bachelor’s degree, but doing it while you are working and earning? Then a look at the MechaFORCESM – Registered Internship Manufacturing Program (M-RIMSM), as the bridge to a well-paying career in Advanced Manufacturing, which may be just for you. M-RIMSM works with NJ manufacturers to build their talent pools in the high skill, high demand occupations needed today, such as machining, fabrication, assembling, mechatronics technician, industrial maintenance, manufacturing technician, welding, metalworking, tool making and CNC (Computer Numerical Control) machining operations to name just a few. Adapting the time-tested “earn while you learn” Registered Internship model developed by the US government under the ApprenticeshipUSA Program, M-RIMSM works with NJ manufacturers to place and develop workers in these high wage, high demand occupations, and then oversees their training and development which result in your earning industry recognized credentials and college degrees. YOU!! Do you have a passion for technology or computing and also enjoy working with your hands? Are you attending high school and want to put that learning to the test? Then let M-RIM know so we can help your school begin a program, or if your school already has such a program underway, still let us know so that we can support you and your school even more. Would you like a career that connects your state-of-the-art academic curricula to one of New Jersey’s most in demand employment sectors – Advanced Manufacturing? Are you looking to get to work sooner and with less debt? M-RIM program can teach you how. M-RIM is an industry-driven training program that combines work-based learning conducted on-the-job (and in a job which M-RIM will help you to find) with related technical instruction that you learn in a classroom setting or online, using the highest industry standards. Learning experiences and education focused on the occupational areas that are in high demand and most needed to fill the advanced manufacturing skills gap. When you graduate High School, a full-time job in NJ as a paid Registered Intern (RI). Classroom instruction that can be applied for college credit putting you on a path to earn an associate or bachelor’s degree, if desired. But if you are not so inclined to the classroom, experience can put you on a path to earning industry-value portable and stackable national credentials. Opportunities to acquire an associate or bachelor’s degree but doing so while you are working and earning. M-RIMSM connects New Jersey manufacturers and educational institutions using the time tested and proven ApprenticeshipUSA dual track learning model. This not only helps NJ manufacturers recruit the current students graduating from today’s career and technical institutions and place them in career tracks within their companies, it also helps define an advanced pathway leading to these exciting career opportunities at the post-secondary level. 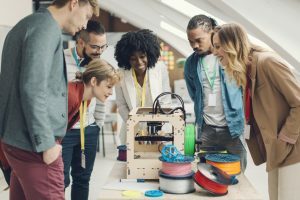 While manufacturers need shop floor talent now, they also need designers, engineers, production managers and technical sales people for the future. M-RIMSM works with NJ Institute of Technology to connect your programs and students like yourself in this high skill, high wage, high demand industry sector. So whether you are looking for full time career opportunities with local manufacturers, or to define a career pathway through post-secondary education into professional employment opportunities in the advanced manufacturing sector, then MechaFORCESM – Registered Internship Manufacturing Program (M-RIMSM) can help.